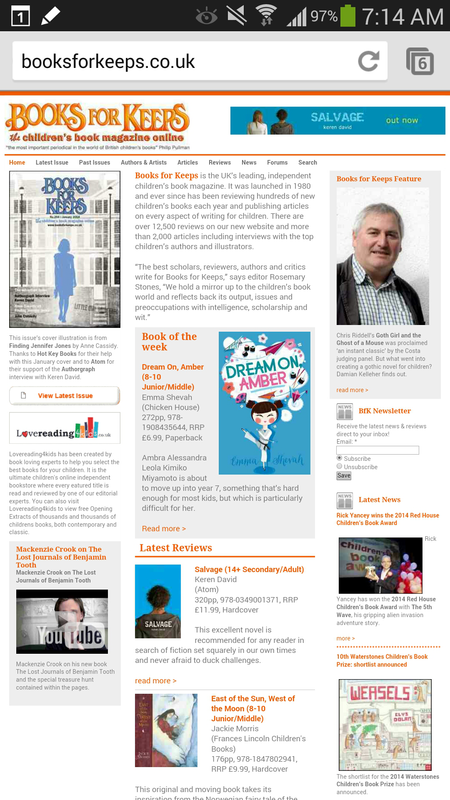 The lovely employees at Waterstones, Bromley recommended Dream on, Amber to a customer who was looking for a book to read and review for school. The customer is called Sophie and she liked the book so much, she did this amazing review, which she then took in to Waterstones, who sent it on to Chicken House, who passed it on to me. THANK YOU SO MUCH to Sophie for your review- it warmed my heart and made me smile a smile from here to here. And thank you to the staff at Waterstones, Bromley. I really appreciate your support and recommendation. This entry was posted in Dream on, Amber. I’m writing a novel about a girl who wants to be an actor. 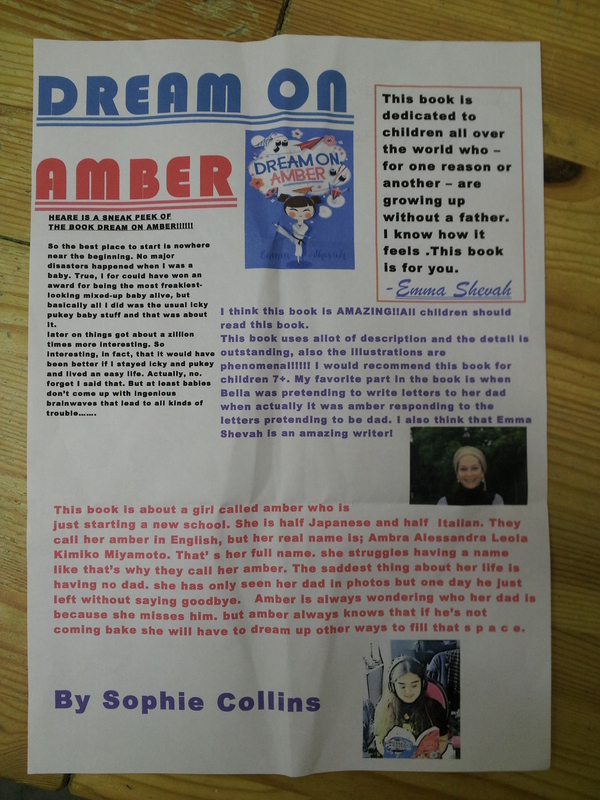 It’s been a busy month of promotion for DREAM ON, AMBER so I haven’t got very far with it, and then every five minutes another idea pings into my head and I want to work on that instead. I probably have some kind of mental hyperactivity – my brain definitely works much faster than I can keep up with. I tell myself that when I get old and don’t have such a hectic life, I’ll write big, long, slow novels full of subtle detail and enormous breadth. But I’m probably lying to myself. This is a hard question to answer because a) I’ve only published one book, b) I have no idea if it is different and if so, how, and c) isn’t every writer’s work different, precisely because each writer is unique and the way he or she tackles themes, characters and language has his or her distinct mark on it? If you think that’s a rubbish answer and I should stop trying to be clever, then I’d say my work is different because it tackles race issues, fits lots of stuff into one small itty-bitty book, is multi-layered and profoundly deep, yet cool and absurd. And has made-up dads in it. Which I’m not sure anyone else has, but I could be wrong. I can’t write big, long, slow novels YET (see above) and I get bored easily so I have to amuse and entertain myself, otherwise a thousand other activities will suddenly seem much more attractive than my novel. So whatever I write will have to be funny. It’ll also be deep because I’m a thinker (I studied philosophy), and a bit sad because life has a raw, transitory tenderness about it. The films and books I like best are the ones that move me: if they don’t, I find them pointless. And I’ll write about issues that bother me, people who fascinate me or ideas I think will help me or other people to understand life, the universe and the way things are or could be. I want the world to be a better place because my books are in it, which just goes to show what an idealistic hippie I am. A few chapters in, when I only had this nebulous blobbie idea of what was going to happen, the publishers said, ‘Can you give us a synopsis?’ And I thought, Shoot. I actually have to think of where this is going. Which made me feel a) a bit cornered and b) a bit anxious, because if you write the synopsis of your novel before you write your novel, what’s the point of writing your novel? It’s like you’ve written it already so writing it gets boring. I gave them a synopsis to keep them happy but to keep my interest up as I go along, I might have to change it radically. Best not tell the publishers that, though. Obviously, I have some idea of where I’m going but I like the freedom of being able to venture off if I feel like it (I travel in much the same way). I write and edit and write a bit more and edit some more, because if the beginning is wrong and annoys me, I can’t go on. Then I get to the middle and wonder why I didn’t study law or medicine, and then force myself to carry on, promising myself all kinds of things I won’t give myself if I get to the end. Then I get to the end, wonder where all the presents I’ve promised myself are, get moody when I don’t get them, then go back to the beginning and do the same thing again and again until I think the book is OK. I get really into it, a bit obsessively. I resent doing anything else once I’m writing. Even eating, cooking or walking the dog. I feel like shouting, I’M WRITING. LEAVE ME ALONE. Then I take a break and do things I’ve needed to do for ages, like buy food, say hello to my children, go to the bank. And voila. A book is born. Pink and soft and crying, it arrives into the world and I wrap it in a fleece and give it a kiss. Or I see it for the bilge it is, chuck it in the bin and start again. Which, luckily, I didn’t do with any of my real babies.